Permanent Endowment executive director Emily Bramhall gave a special tribute to Brock Callen, retiring executive director of Sail MV. 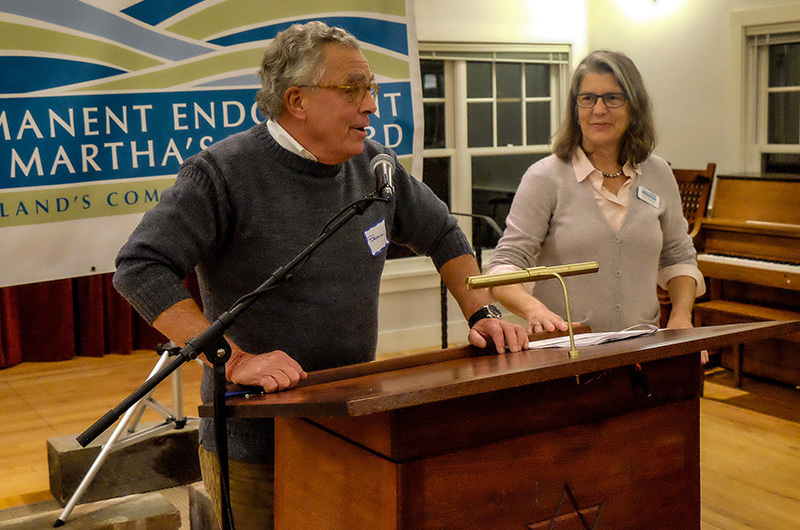 The Permanent Endowment for Martha’s Vineyard, an organization created to offer perpetual financial support to Island nonprofits, was founded 36 years ago with an initial bequest of $60,000. Three decades later, the endowment has the resources to give away nearly three times that amount. In one evening. Since its inception in 1982, the endowment has grown into 50 separate funds valued at more than $13 million, giving away $7.1 million to hundreds of Island nonprofits, supporting scholarships, as well as donor discretionary, and project funds. “When we did the math and added it up and realized we had broken $7 million, we had a little wow moment at the office,” Ms. Bramhall said. On Thursday, the endowment announced the recipients of its endowed grant funds. The funds meet the interests and wishes of the donors and are matched to appropriate Island nonprofits that work in the arts, health, environment and community. The endowment board received more than 40 applications, hosted face-to-face interviews and used nine criteria to ultimately decide on 30 recipients. Those organizations ranged from the Martha’s Vineyard Chamber Music Society, which won a grant to hire a cello teacher for its students, to Biodiversity Works, a conservation organization that plans to use the funds it received Thursday night to produce bilingual informational packets about the Island’s bat and snake population. A few organizations, like the Martha’s Vineyard Institute of Creative Writing, were first-time recipients. They writing institute will use the money to host off-season, on-Island writing workshops. Martha’s Vineyard Youth Tennis, an organization that has relied on the generosity of one benefactor for the past 20 years who bowed out in September, also received its first grant. Advocacy for children was a theme throughout the night. Laura Walton, who spoke on behalf of the Martha’s Vineyard Children’s Chorus, read aloud a letter from the mother of one young chorus member with epilepsy and autism whose disabilities prevent her from participating in other after school activities. The Island Grown Initiative received a grant to help process and compost more than 20 tons of food waste at Island schools. Grants also went to help at-risk communities on the Island, like the growing elderly and homeless populations. Grants for Windemere and the Martha’s Vineyard Hospital will go toward building new wheelchair and accessibility lifts, while the Martha’s Vineyard Network for Homeless Prevention received money to partner with hotels and offer evicted tenants short-term shelter and security. Ms. Toohey often has mothers come to her office and say that they have been evicted from their rental with no place to go. Without the Permanent Endowment, she said servicing those in need would be impossible. “It’s a life saver,” she said. At the end of the evening, special recognition went to Brock Callen, the retiring executive director of Sail Martha’s Vineyard, an organization dedicated to protecting the Island’s maritime heritage though instructional, skills-based sailing and Coast Guard classes. “To the directors of the endowment, he is a standout example of dedication to the mission of his organization and of how one person can make a difference in someone else’s life,” Ms. Bramhall said.